2) It’s not as expensive as you might think. Remodeling a room by adding a gas fireplace can cost as little as $5,000 installed, resulting in a dramatic transformation to be enjoyed for years to come. 3) The investment of adding a gas fireplace almost pays for itself. About 91 percent of the cost of adding an “excellent” quality direct vent gas fireplace to a home can be recouped when selling the home, according to figures provided by Marshall & Swift’s appraiser’s handbook and the average cost of a gas fireplace, including installation. 4) Makeover your whole house, with one investment. By adding a fireplace to your home you can create a whole new living experience for your entire family. 5) It’s inexpensive to operate a gas fireplace. Based on national averages, a natural gas fireplace consuming 27,000 BTUs/hr will cost less than 20 cents/hr to enjoy. 6) Gas fireplaces are easy to enjoy. Bedroom, living room, bathroom or bar area – it doesn’t matter! There are gas fireplaces of all shapes and sizes that can quickly be installed in almost any room of a single family home. Once installed, there is no need to deal with dirty firewood wood or smoke and byproducts every time you want to enjoy a soothing fire… just flip the switch (or tap you remote) and let the relaxation begin! 7) Gas Fireplaces can reduce your yearly heating costs. Often referred to as “zone heating,” the concept is simple. After turning down the temperature on the home’s central thermostat, the homeowner heats the areas of the home where the most time is spent (often the family or living room), with their gas fireplace. This keeps those rooms warm and comfortable and reduces the amount of money spent heating rooms that don’t get used as much. Gas fireplaces can also help you save on heating costs by proving warmth during unpredictable or “in-between” weather when it’s not cold enough for the central heat, but you still need some warmth. 8) New gas fireplaces won’t waste gas or electricity. When equipped with an Intellifire Plus Ignition System, the gas fireplace will only provide an ignition flame only when needed and has a battery backup system that supplies power to spark the ignition flame in the event of a power outage. This means even more energy and cost savings. 9) Today’s modern fireplaces can double as a piece of art, thanks to innovative, sleek designs and vibrant flames. The Heatilator RAVE is the perfect example of “fire art” with its Razor burner technology and continuous levitating flame. 10) Fire provides an inherent calming effect. Since the beginning of time, humans have been drawn to fire. Bring the soul-soothing effects of a lustrous fire safely into your home with a gas fireplace, and you can begin to experience the benefits of deep relaxation. Make your own home feel like a lavish vacation destination! Adding a fireplace truly makes your house, a home. Browse our product catalogue and check out all the options Heatilator has to offer you. 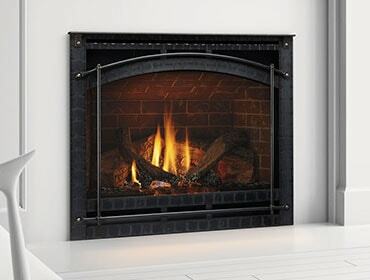 Your new Heatilator Gas Fireplace is just a few clicks away….